Sonia Bonet’s family is a real risk-pool buster. Sure, her husband’s experimental treatment is easy enough to disallow, but her resulting crime spree is harder to sweep under the rug. Their lucky son Dario gets to witness it all in Rodrigo Plá’s A Monster with a Thousand Heads (trailer here), which screens during the Film Society of Lincoln Center’s Neighboring Scenes: New Latin American Cinema film series. Plá and screenwriter (wife) Laura Santullo do not waste time with a lot of medical rigmarole. Sonia’s husband Guillermo is dying of something, but a radical new treatment caused measurable improvement. However, they had to mortgage their home for the first round of narrative widgets. To continue, they need their insurance company, Alta Salud, to reverse its decision. Unfortunately, Guillermo is relapsing rather badly. Desperate for help, Bonet camps out waiting for his doctor at the corporate headquarters, which makes Alta Salud look more like a managed care conglomerate. Of course, Dr. Villalba and the front office staff give her the run-around so Bonet follows him home, taking the doctor and his wife hostage in a half-planned act of madness. Thanks to the sympathetic Mrs. Villalba’s information, Bonet heads off to the racquet to target the company president and HR director (who really shouldn’t have anything to do with customer coverage issues). The old president is a pretty cool cucumber, but the slimy HR hack makes a lunge for Bonet’s, taking one in the leg as a result. That should basically seal Bonet’s fate, as we can gather from the suspense-killing flashforwards to her criminal trial, but she still has an extended dance to play out with Alta Salud’s morally ambiguous president. Plá and Santullo made a big international splash with the class conscious La Zona (The Zone), which had its excesses, but still manages to pull viewers through at a brisk gallop. While Monster shares surface similarities, it lacks the best known collaboration’s super slickness—and it is rather missed. In a way, Monster manages to be half-pregnant most of the time, wagging its finger at insurance/managed care companies at what they have reduced Bonet to, but it never lets her cut loose like an Uwe Boll leftist vengeance-taker. Jana Rulay is convincingly frantic and frayed as Bonet. Plá forces her to walk a precarious tightrope with righteousness on one side and full blown psychosis on the other, but she largely pulls it off. Arguably, Emilio Echeverria’s performance as the president is either the film’s greatest strength or weakness. It is a surprisingly subtle, nuanced turn that makes it difficult to demonize the old goat. 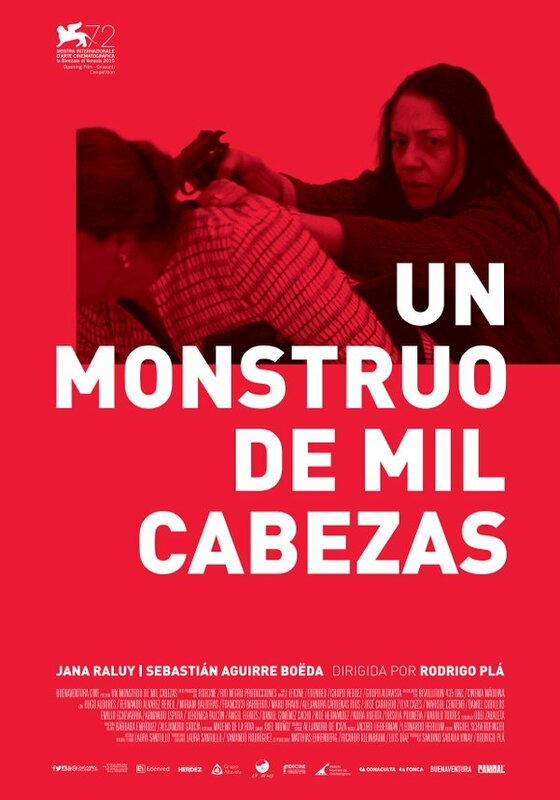 That would be problematic if Monster were a true revenge thriller, but Plá is not about providing vicarious satisfaction. Monster is so frustrating, because there is so much visceral energy in individual scenes, yet it does so much to undermine its overall impact. Plá is a filmmaker worth following, but La Zona remains his most successful politically charged thriller to date. Primarily for those looking to applaud its message, Monster with a Thousand Heads screens this Saturday night (1/9) at the Walter Reade, as part of this year’s Neighboring Scenes film series.